In Part One of this series, we discussed what supplies are needed to make a batch of cold-process soap. Hopefully everyone has had a chance to pick up the supplies on the shopping list, and is ready to get going. I have been making soap for a couple years now. When I first began, I was afraid of the lye. I had on goggles, gloves, long sleeves--basically, there was not a scrap of skin exposed any where on my body. Now that I have been making soap for a while, I no longer wear the goggles and gloves. Please understand that I am in no way saying you shouldn't wear goggles, gloves, or anything else to protect your body while making soap; after all, I did put those items on the supplies list. I just choose not to, but that is my personal choice. I have never been injured while making soap, but I understand that accidents do happen. The reason I am mentioning this is because you will likely notice in some of the photos that I am not wearing gloves, so I figured I had better address this. The way I look at it, every time I cook, there is a chance I could splash boiling water on myself or get splattered with hot grease, cut my finger with a knife, or grate off a chunk of my hand on the cheese grater (okay, I may have actually done that one)--but when I cook, I don't get decked out in safety gear. I just cook and use common sense. I view making soap much the same way. Use common sense and be careful, just like you are by a hot stove. 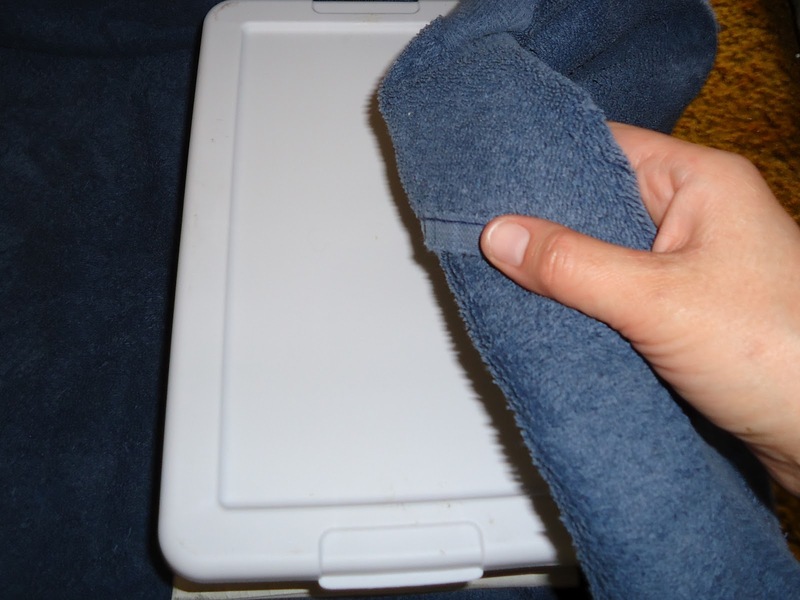 Avoid spilling the lye while measuring, and don't let it splash while you are stirring the lye into the water. 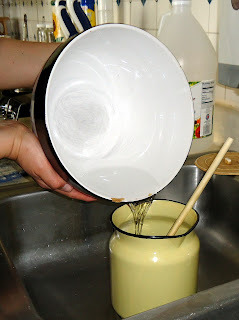 If you do spill any lye on your skin while you are making soap, rinse well with water. This Material Safety Data Sheet (MSDS) for Sodium Hydroxide (lye) contains more safety information if you are interested. 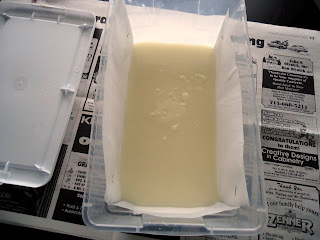 So, now that we have our safety heart-to-heart out of the way, we will move on to the fun part: making soap! 1. Begin by preparing your mold. Line it with parchment paper to make for easy removal. Alternatively, you can line your mold with wax paper or plastic wrap, or grease your mold liberally with vegetable shortening. Set your mold aside until you are ready to pour your soap in. Your mold can be lined with parchment paper by folding it to fit, and then stapling to allow the parchment paper to stay in place. 2. 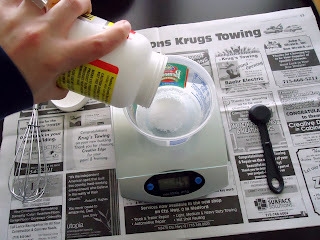 Using your scale, measure out 2 ounces of lye. Protect your work surface with newspaper to keep lye off of your table or counter. 3. 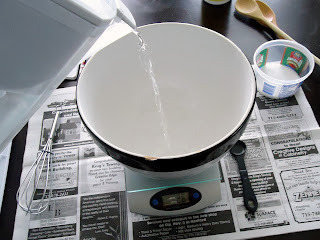 In a separate bowl or pitcher, measure out 6 ounces of water. I like to use a roomy bowl for the water to prevent any lye/water solution from splashing out while I whisk. 4. Place your bowl of water in the sink or other safe, out of the way spot. Carefully sprinkle the lye into the water (always add the lye to the water; doing it the other way around will cause splattering and potential for injury). 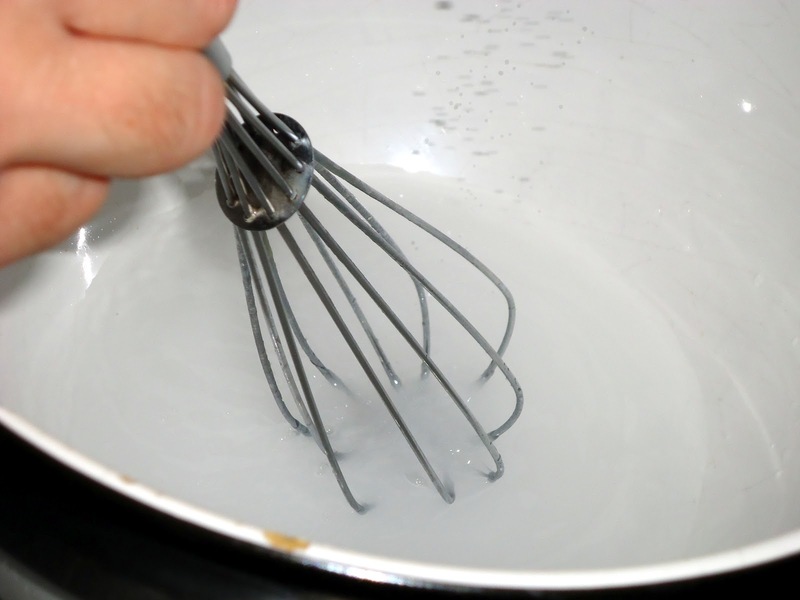 Stir or whisk until the lye is completely dissolved. When you are combining lye and water, unpleasant fumes will briefly be produced. Turn your head away from the mixture to avoid breathing in these fumes. You may want to turn on a fan or open a nearby window during this step. I am whisking as I sprinkle the lye into the water. The lye/water mixture will begin to heat due to a chemical reaction. It will generally get up to around 180 degrees Fahrenheit. This mixture is hot and caustic, so do not touch it with bare skin. Make others in your home aware of the hot, caustic mixture in your sink, and be sure they know not to touch it. Leave the lye/water mixture to cool while you prepare the oil. 5. 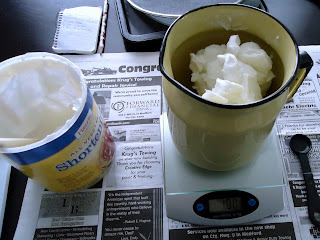 Measure out your vegetable shortening (if you are using a 1 lb. can, obviously it will not be necessary to measure) into a large stainless steel or enamel pot. On medium-low, heat the shortening just until melted, stirring frequently. Once melted, remove from burner. You want to keep the temperature as low as you can so that it wont take too long for the temperature to lower in the next step. 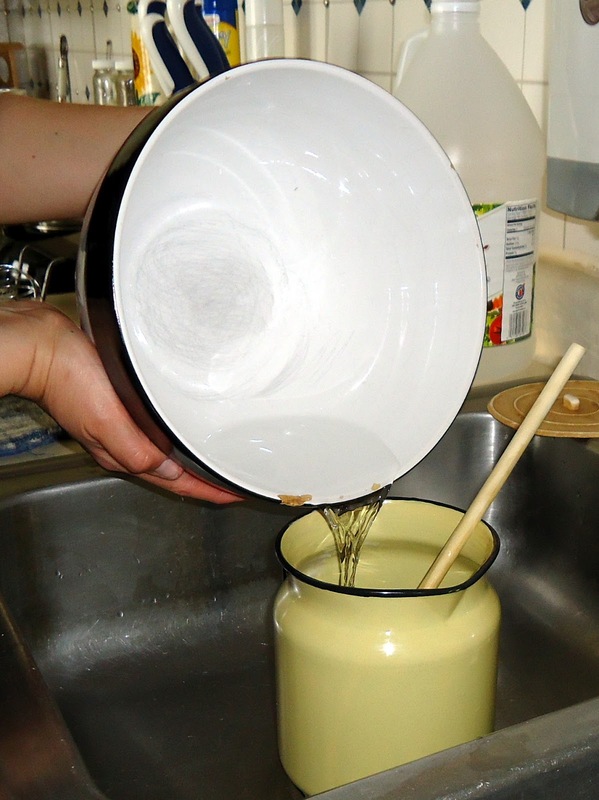 A pitcher pot is handy to have for melting the oil because it allows for easy pouring once your soap is ready to be molded. 6. 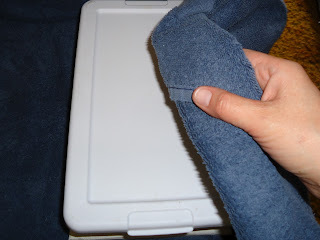 Allow both the shortening and the lye/water mixture to cool to 100 degrees Fahrenheit. Use your thermometer to periodically check each mixture. When they are both cooled to 100 degrees, you will be ready to proceed to the next step. Allow both the oil and lye to cool to 100 degrees Fahrenheit. Do not be overly concerned if one cools more quickly than the other--if both mixtures are not exactly 100 degrees, it isn't the end of the world. Your soap will likely turn out just fine. Just get it as close as you can and don't fret. Soap is pretty forgiving. If one is at 100 degrees and the other still has a ways to go, put a couple inches of hot water in the sink to keep the one already at temperature warm while the other continues to cool a bit more. 7. Carefully pour the lye/water mixture into the melted shortening and begin briskly stirring or whisking (you can even use an immersion blender to speed things up). 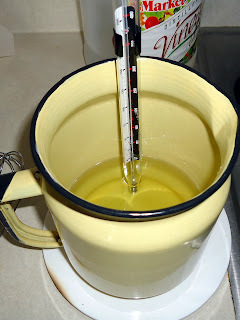 Once you have poured the lye solution into the oil, you will likely notice an immediate clouding and perhaps thickening of the oil. As you stir, the lye, water, and oil will continue to thicken. You must stir constantly and briskly during this step. When the mixture starts to thicken, you can test to see if it is ready to be molded. 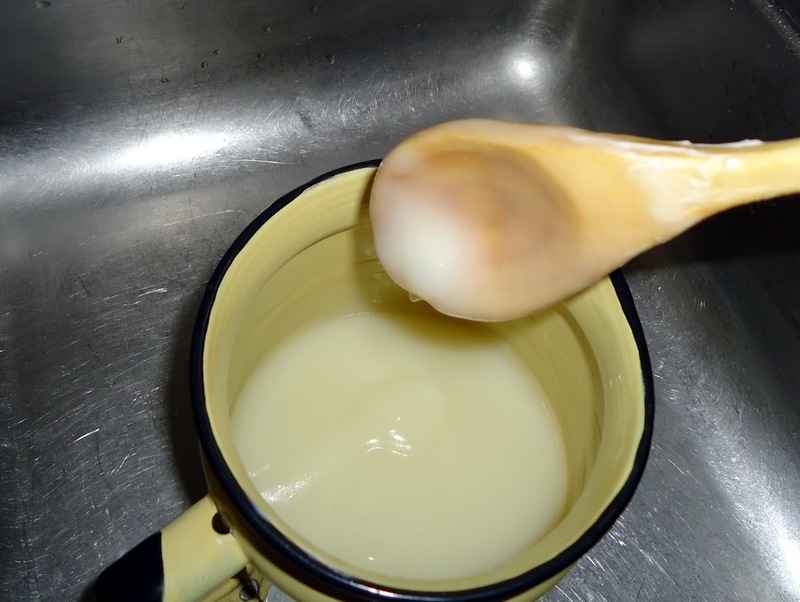 Just pick your spoon up out of the mixture and allow some of the soap to drizzle off the spoon back into the rest of the mixture. If the soap stays on top for a second before sinking back down into the rest of the mixture, it is ready to be poured into the mold. This stage is called "trace"--meaning a trace or trail will be left on your soap when it is drizzled on top. The time it takes to reach trace can vary. Sometimes it will happen almost immediately, and other times it will seem as though you are stirring and stirring, and nothing is happening. I had a batch once that I stirred for over an hour, and finally said, "Forget this!" and just poured it into my mold. Well, the soap turned out just fine even though it hadn't reached "trace." That is a rare occurrence however, and like I said, soap is pretty forgiving (obviously, since it still turned out, right? ), so don't be too worried if you've stirred for a long time and it doesn't seem to be getting to trace. The important thing is that the lye/water mixture and the oil is thoroughly combined, and not separating. There is a really good video with David Fisher that explains trace. 8. Once your soap has been thoroughly combined, you can pour it into your mold. 9. 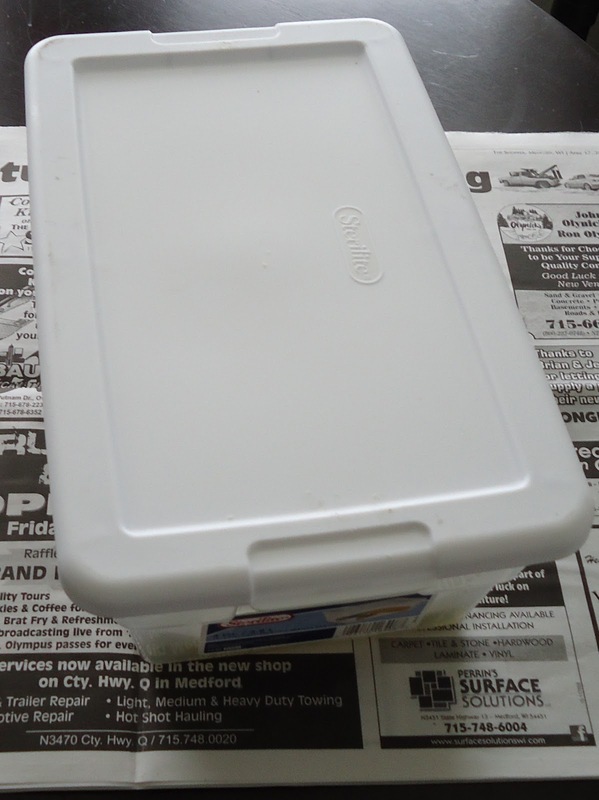 Cover the mold, and place it in an out of the way spot where it can be left for 2 days. This spot will preferably be in a warm room. 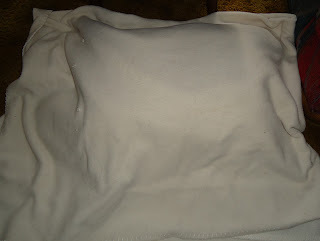 Wrap the mold in towels or blankets to keep it warm (I wrapped mine in a towel, and then covered it with a blanket), and then leave the soap in this "insulation" period for two days. 10. After the 2 days have passed, you will unmold your soap. 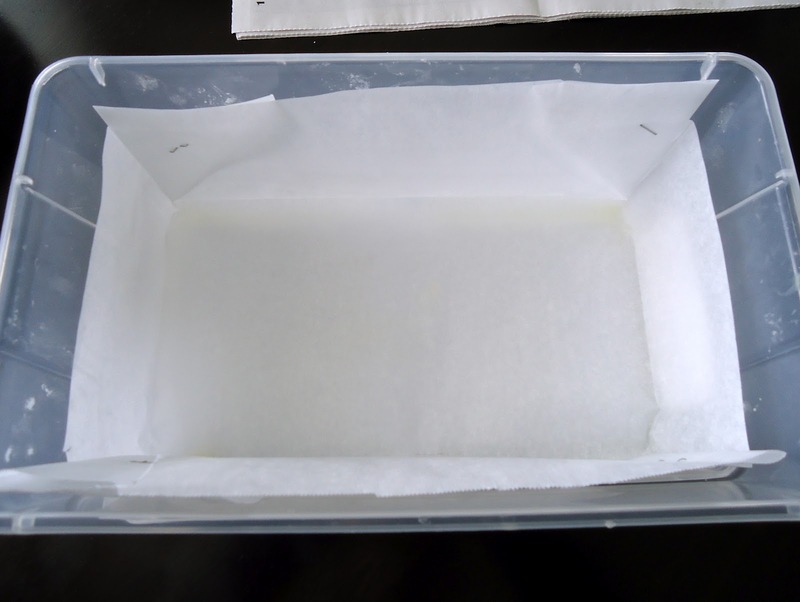 If you used parchment paper to line your mold, the soap should easily come out. 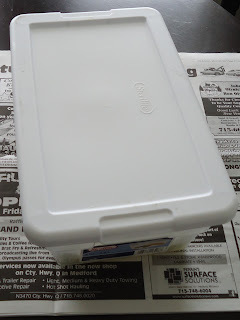 If you are having any trouble removing the block of soap from the mold, try putting it into the freezer for a couple hours. When the soap freezes, it should contract from the edges of the mold, allowing for easier removal. 11. Place the block of soap onto a cutting board, and cut it into bars (any size you like is fine). 12. You will need to cure your soap for four weeks. This means, you will lay your bars of soap on their sides in an out of the way area, and allow them to just sit for four weeks. During this time, you will want to turn them--once a week is probably fine--to allow air to reach all sides. You can cure them on racks if you'd like, but it isn't a necessity. You may want to loosely cover the bars with cheesecloth to keep dust or pet hairs from landing on them. I have an old dresser that I use to cure my soap in. I lay the bars out in the drawers, and then close them up, preventing any foreign particles from landing on my bars. 13. Once four weeks has passed, your soap is ready to use! Do you have a homemade laundry detergent recipe? Best learning experience. Now, you can make your own soap. 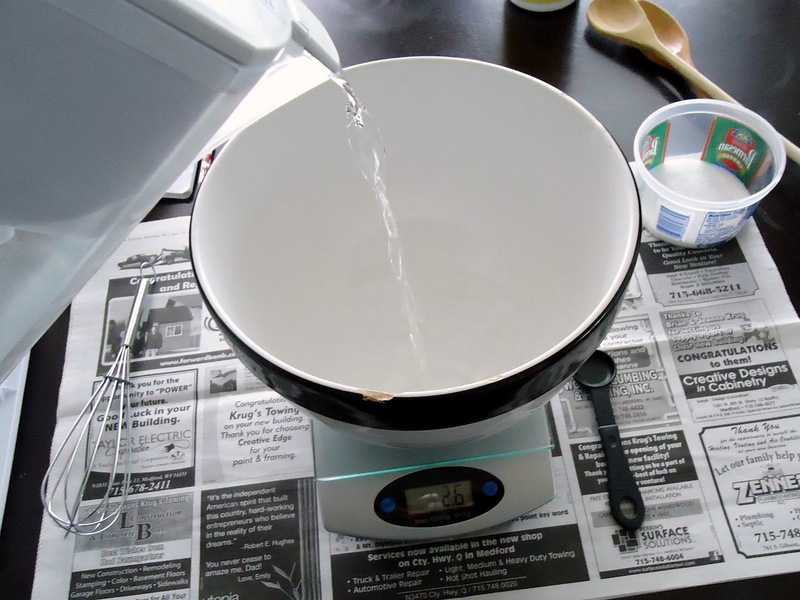 Visit soap making supplies which offers best supplies to make soap.